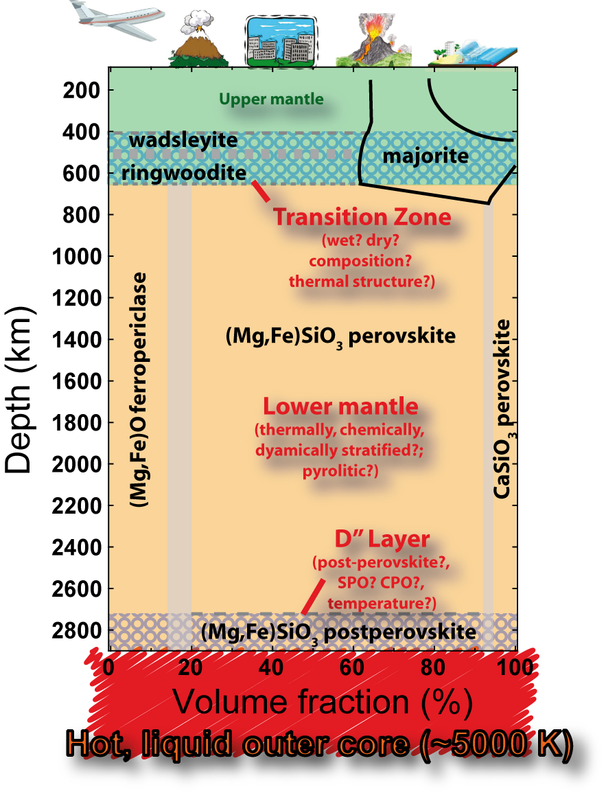 Project Summary: Geological events that affect our lifes on the Earth’s surface are driven by dynamic processes in Earth’s mantle, the large convective system that connects the hot, liquid outer core and the Earth’s surface. The Earth’s mantle, however, is not accessible to direct observation and consequently, its structure, properties and dynamics are poorly understood. Fortunately, a lot of information about the inaccessible deep interior of our planet is encoded in the propagation characteristics of earthquake waves that travel through the deep Earth (analogue to the ultrasonic testing used in medicine). An interpretation of the images obtained by the study of earthquake waves critically relies on quantitative knowledge of the elastic and structural properties of geomaterials at the extreme conditions of pressure and temperature that are characteristic of the Earth’s deep interior. Within the GeoMaX project, we perform in-situ measurements of elasticity and structure of single-crystalline Earth materials at relevant pressure-temperature-conditions. These experiments are now becoming possible, because of (1) the recent installation of world-wide unique cutting-edge instrumentation at BGI Bayreuth, (2) improved designs of heated high-pressure devices, and (3) new sample preparation techniques. 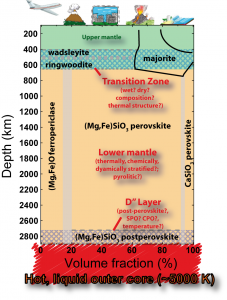 The synergy of this new mineral physics data set and recent seismic data will lead to novel physically-constrained geophysical models of the Earth’s mantle. Ultimately, this will provide the basis to understand Earth’s convective system and model its effect on surface life. Schulze, K.*; Buchen, J. *; Marquardt, K.,Marquardt, H. (2017): Multi-sample loading technique for physical property measurements in the diamond-anvil cell. In press, High-Pressure Research (Link). Nishiyama, N.; Ishikawa, R.; Ohfuji, H.; Marquardt, H.; Kurnosov, A.#; Taniguchi, T.; Kim, B.-N.; Yoshida, H.; Masuno, A.; Bednarcik, J.; Kulik, E.; Ikuhara, Y.; Wakai, F.; Irifune, T. (2017): Transparent polycrystalline cubic silicon nitride. In press, Scientific Reports (Link). Kurnosov#, A.; Marquardt, H.; Frost, D.J. ; Boffa Ballaran, T.; Ziberna, L. (2017): High-pressure single crystal elasticity measurements of Al-Fe-bridgmanite support a Fe3+-rich pyrolitic lower mantle. Nature, DOI 10.1038/nature21390 (Link). Kawazoe, T.; Buchen*, J.; Marquardt, H. (2015): Synthesis of large wadsleyite single crystals by solid-state recrystallization. American Mineralogist, 100, 2336-2339 (Link). Mookherjee, M.; Speziale, S.; Marquardt, H.; Jahn, S.; Wunder, B.; Koch-Müller, M.; Liermann, H.-P. (2015): Equation of state and elasticity of the 3.65 Å phase – a candidate cause of the seismic X-discontinuity. American Mineralogist, 100, 2199-2208 (Link). Marquardt, H.; Speziale, S.; Koch-Müller, M.; Marquardt, K.; Capitani, G. (2015): Structural insights and elasticity of single-crystal antigorite from high-pressure Raman and Brillouin spectroscopy measured in the (010) plane. American Mineralogist, 100, 1932-1939 (Link).